Alfa Romeo has a colorful history of making some beautiful coupes and sedans, but in 2018 the automaker knows what sells, and that’s crossovers. 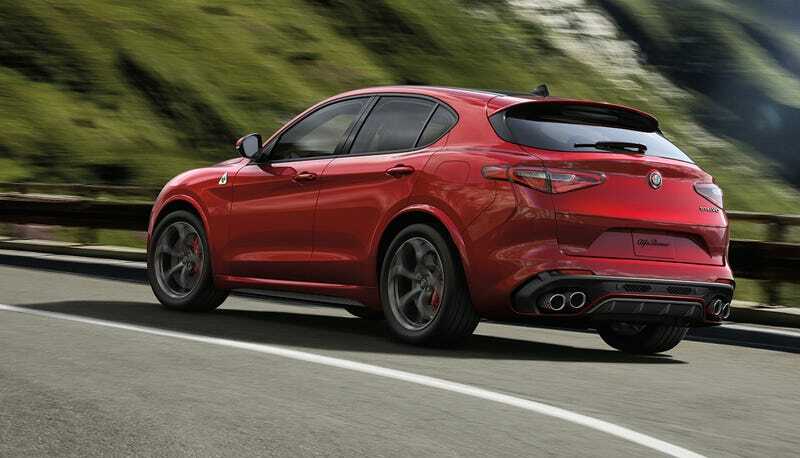 Of course, a modern Alfa buyer doesn’t want just any crossover—they want one with 505 furious horsepower, so the top-shelf Stelvio will set them back some serious coin. The Alfa Romeo Stelvio is a compact crossover similar in size and price to an Audi Q5 or BMW X3. But because Alfa has that glorious Ferrari-derived twin-turbo V6, they can’t just use it on the Giulia Quadrifoglio sedan. So they crammed it into a crossover allowing the high-riding hatchback to run the sprint to 60 mph in under four seconds witg a top speed of 176 mph. According to Alfa, it will also lap the Nurburgring in 7 minutes 51.7 seconds, which is the current record for a crossover, if you care about that kind of thing. The price for all this style, speed, and the extra helping of practicality starts at $79,995 ($81,590 including destination), which is about $6,000 more than the Giulia QF. This is before you start adding additional options like the carbon ceramic brakes, which is naturally a necessity on a crossover. Option prices have not yet been released but the carbon binders run about $8,000 on the Giulia, so expect similar pricing for the Stelvio. By comparison, a 440 HP Porsche Macan Turbo with the Performance Package will set you back almost $88,000 before you even start checking options boxes. Hopefully, the Stelvio Quadrifoglio won’t be plagued with some of the reliability problems of the Giulia, because the despite the sticker shock it is a heck of a value.